We all remember sitting down to lackluster cafeteria food and the steps people would take to improve the taste. But what do you do if your favorite condiment is 7,000 miles away? Jessie Guajardo, a first lieutenant for the Texas Army National Guard who is currently stationed in Iraq, faced such a challenge. “I am currently deployed in Iraq where the food can become unappetizing very quickly,” Guajardo recounted in a Facebook post. “While eating overcooked and bland chicken tenders one Sunday night (ironic, huh? ), a couple of fellow Soldiers and I were thinking of how we could make the chicken more edible,” he added. Bottles of sauce were out of the question, because the soldiers couldn’t refrigerate them. So Guajardo sent a message to his hometown Chick-fil-A in Flower Mound, Texas, requesting individually packaged Chick-fil-A sauces. It also helped that Guajardo has had a couple of connections to this particular Chick-fil-A going back to high school. In addition to being a regular customer, the restaurant awarded him a scholarship for a unique competition during his senior year. Guajardo got the chance to kick a field goal during halftime of his high school’s football game for a chance to win a scholarship awarded by the restaurant. His other connection also centered on sports. The husband of Michell Hodapp, the restaurant’s marketing director, coached Jessie and his brother in baseball. “We would have done it no matter who asked us, but it was a total coincidence that we knew him,” Hodapp said. Hodapp mailed the care package, but didn’t tell him she was sending it because she wanted it to be a surprise. And it was. Guajardo was thrilled two weeks later with two cases of barbecue and Chick-fil-A Sauce that showed up the same day chicken tenders were being served. “After I brought the cases into a common area, everyone was ecstatic to see the appetizing sauces,” Guarjardo posted on Facebook, prompting the story to spread quickly. Guajardo . Local TV stations interviewed the restaurant staff. Driscoll and his team were amazed at the response. “We did all of this under the radar; we didn’t even let him know we were sending the sauce. We never anticipated any of this,” Driscoll says. 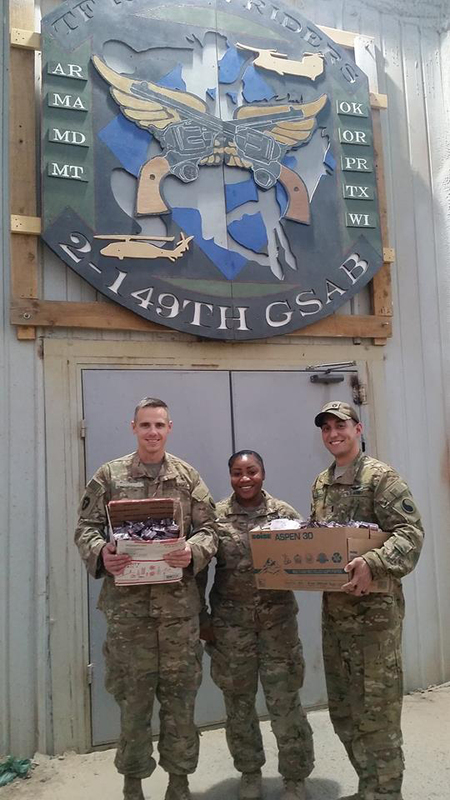 For Guajardo, the care package meant more than just better tasting chicken strips. “This seemingly small gesture…single handedly picked up the spirits of so many people,” he wrote.